These are my pulses, my legumes, my dried old beans, my sad, lonely, lentils. I compulsively buy legumes from bulk stores, put them in pretty jars and rarely use them. I own an entire book on heirloom beans, pages tagged at deliciously pulse-ridden recipes that I have never made. Having an influx of legumes has caused me to create a singular New Year’s resolution – to cook my way through the stockpile. Big goals, big dreams – that’s me. I take great satisfaction from using things up that may otherwise go to waste. At the market, I have grand illusions that I will be able to cook more than I have the time for, and now, with a newborn, this situation is only compounded. So, I cooked up a big pot of soup to use some of the beans and the veggies that were sadly deteriorating in my icebox. 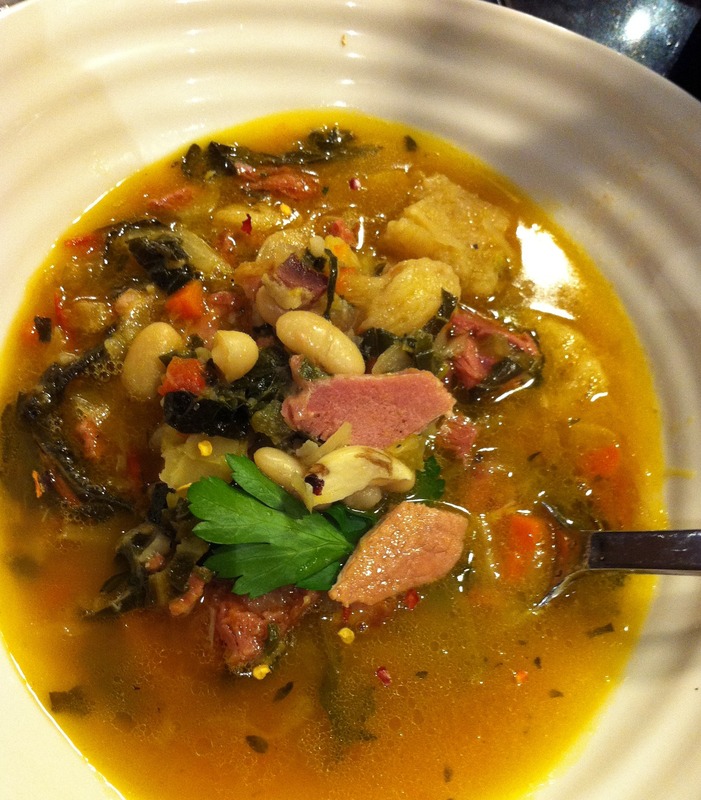 Ribollita is one of my favourite soups; it reminds me of a lunch I enjoyed in Firenze with two of my dear friends. 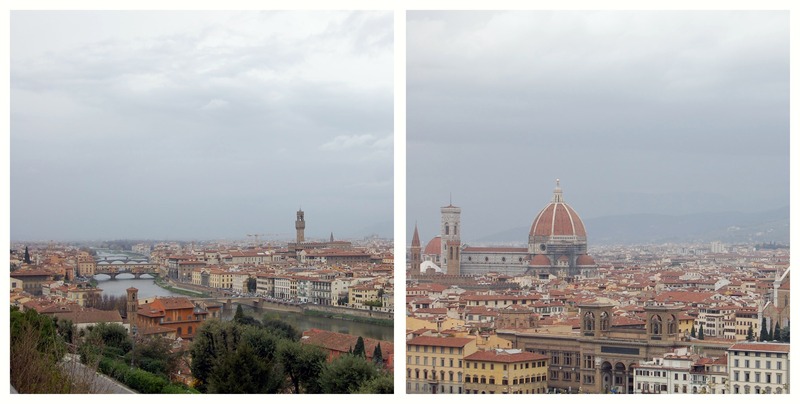 We had just climbed above the city to San Miniato al Monte, heard Gregorian chanting monks and explored the gothic graveyard while a black cat followed us. We descended back down into the Oltrarno, soaked and hungry, we saw Osteria Antica Mescita – a picturesque osteria that happened to have the slow food symbol on its door. Perfecto! 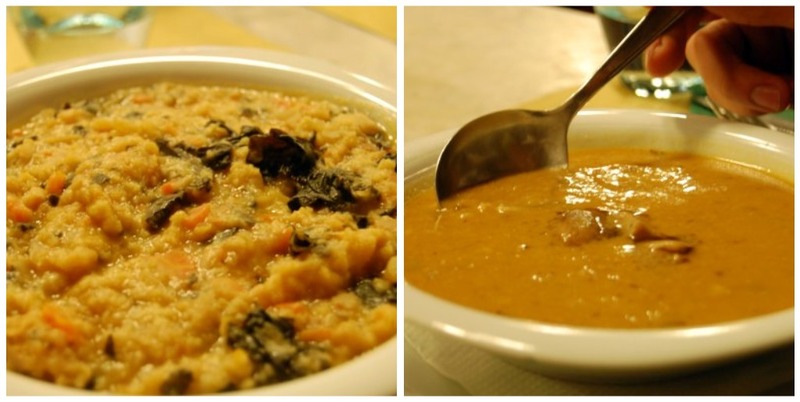 I ordered ribollita, my friends ordered zuppa di ceci con farro e porcini– the meal lasted hours, living up to its “slow” distinction – thankfully the deliciousness made up for the service. Recipe adapted from epicurious and my mind. 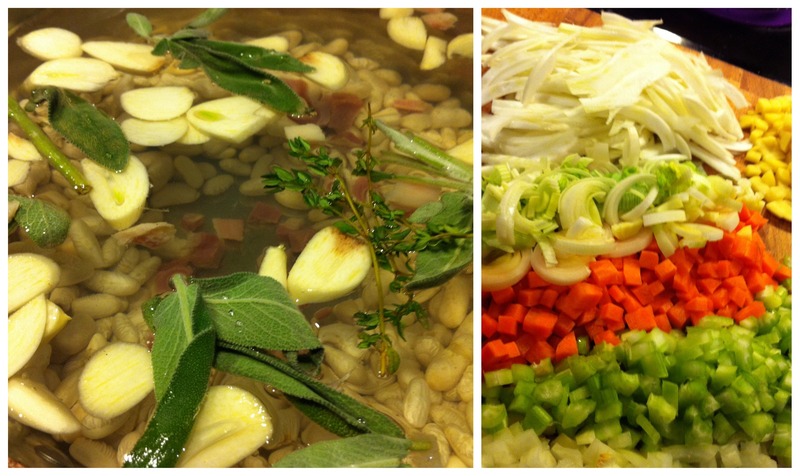 1) Combine 8 cups water, beans, sage, thyme, bay, pancetta, and garlic in large saucepan. Bring to boil; reduce heat, cover, simmer until beans are tender, adding more water to keep beans submerged, about 1 ½ hours. 2) Add 1-teaspoon sea salt; simmer 10 minutes. Uncover and cool beans in liquid. 1) Heat 3 tablespoons oil in cast-iron pot over medium heat. Add onion and leek; sprinkle with sea salt. Cook until onion is translucent, stirring often, about 5 minutes. 2) Add chopped garlic, safe, thyme and bay; stir 2 minutes. 3) Add celery, carrot, potato, squash, and fennel; cook until vegetables are tender and begin to caramelize in spots, stirring often, 15 to 18 minutes. 4) Add kale, chard, cabbage, tomatoes, Parmesan rind, whole ham hock. Cover with chicken stock, and add 1 teaspoon sea salt. Bring to boil; reduce heat to medium-low, cover, and simmer until vegetables are very tender, about 1 1/2 hours. 5) Add beans with cooking liquid and crushed red pepper. Add 2 cups broth. 6) Remove ham hock – let cool and remove meat from bone. Add back into soup. 7) Season with salt and generous amount of pepper. 8) Add bread to soup and simmer, stirring often to break up bread into smaller pieces and adding more broth if needed to thin, if desired. 9) Season with sea salt and pepper, and squeeze juice of lemon into soup. 10) Divide ribollita among bowls, drizzle with extra virgin olive oil and parsley. The best class I have taken at my culinary school has been the Slow Food class. Our teacher is one of the leaders of the Toronto Slow Food convivium and has led us through some amazing taste workshops and has brought in many great chefs, farmers and business people. So, what is slow food? Slow Food is an organization that began in Piemonte, Italy by a man named Carlo Petrini. The basis of the slow food movement is that…Food must be GOOD (healthy and delicious)….Food must be CLEAN (produced sustainably)….and Food must be FAIR(produced and distributed in ways that respect social justice). These are the guiding principles. Very basic, but also very complex. One of our field trips was to a farm outside of Guelph, Ontario owned by Jo Marie Powers. Her and her husband produce a small amount of maple syrup each year and she had us come up to help her make a batch. We gathered wood, emptied buckets and kept the fire burning under the molten hot syrup as it reduced down and down and down. We arrived and were greeted with an amazing breakfast of cakes and breads, coffee, tea and hot cider. It was amazing after a long bus-ride from the city. Getting away from the city, being outdoors and enjoying a new experience was just what we needed to break up the winter blahs. 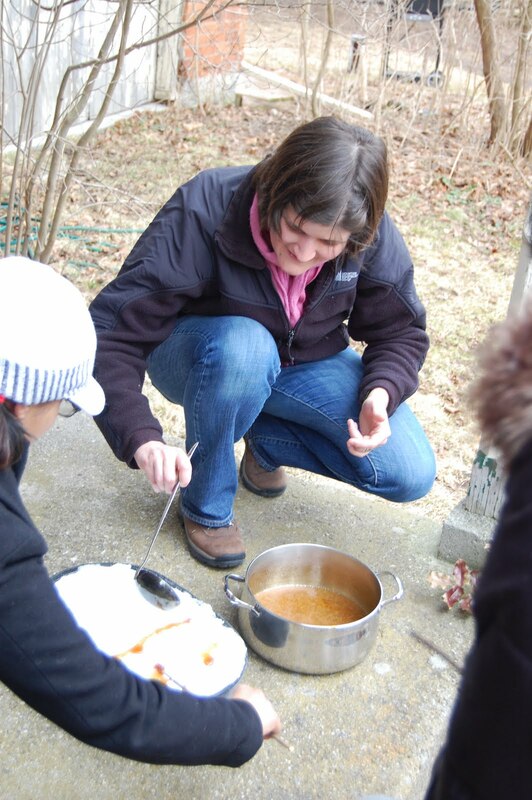 After lunch, and before we got back on the bus, we were taught how to make tire d’érable﻿, which is essentially maple candy poured on snow and eaten with a stick. A pure maple sugar lollipop. After the syrup is poured onto the snow, you take a stick and roll up the (now) hardened syrup onto your stick and lick lick lick away. Head-buzz to follow. It’s so addictive you must have two, or three. A guaranteed sugar high all the way back to Toronto. Yeehaw.